Corvallis High School welcomes all students and offers a balanced and challenging educational program. Our goal is for our graduates to possess the knowledge and skills needed to live productive and satisfying lives. Our excellent staff is passionate about helping students reach their academic goals and our administrative team is dedicated to creating a safe and welcoming environment for all students, families, and staff. Corvallis High School has a diverse student population. Programs in our school include an inclusive learning environment for emerging multi-lingual students and for students with a wide range of learning abilities. Enrollment for 2016-17 was 1,252; nearly 1 in 5 CHS students are identified as Talented and Gifted, 3% are English Language Learners and almost 1/4th of our students participate in the Free & Reduced Meal Program. 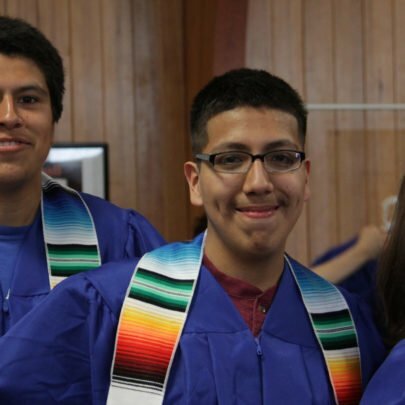 We are proud to provide an educational pathway for students pursuing the Oregon Seal of Biliteracy. Learn more about the Seal of Biliteracy here. Parents and other volunteers play an important role in contributing to student success at Corvallis High. Under professional direction, Beyond CHS, the school’s college and career center, is staffed largely by volunteers. Parents and community partners often participate in classrooms and programs to enrich our student’s learning experiences. The Spartan athletics program has a long-standing tradition of excellence and is strongly supported by community volunteers. Mr. Boring has been the CHS principal since 2011. Before coming to Corvallis he was the assistant principal of Sherwood High School for six years. He has 16 years of experience teaching English at the high school level and also worked as the administrator of Sherwood’s alternative education program. In addition, he’s been a high school football, basketball and baseball coach. Earlier in his career he taught in Salem at McNary High School, West Salem High School and South Salem High School, as well as at schools in New Haven and New Milford, Connecticut. Mr. Boring earned his bachelor’s degree in English at Willamette University and a master’s degree in English and education from Western Oregon University. Mr. Navarra has been an assistant principal at CHS since 2015. He most recently was the assistant principal at Madras High School. He taught in Colombia for three years and spent seven years teaching middle school social studies and language arts in Lake Stevens, Washington. Mr. Navarra received his bachelor of arts in Political Science and Spanish and a master of arts in Teaching from the University of Portland. He also earned a Master of Education Leadership and Administration from Jones International University. He is fluent in Spanish and leads the CHS Juntos group. Ms. Works has been an assistant principal at CHS since 2013. Prior to this role, she was a teacher in the Corvallis School District for 29 years at the secondary level, both middle and high school, and most recently at Corvallis High School. She has served on a number of district committees, and state and national level committees, most recently on Governor Kate Brown’s Council on Educator Advancement aimed to support high quality teaching and to develop a culturally competent workforce throughout the state. Ms. Works received her bachelor of arts in 1977 and a masters degree in 2008 from the University of Oregon.